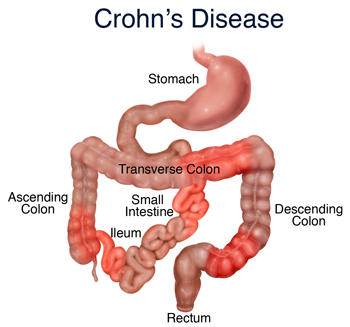 Crohn’s disease is an idiopathic inflammatory disease of the small intestine (60%), the colon (20%), or both. It involves all layers of the bowel but most commonly involves the terminal ileum. It is slowly progressive and recurrent disease with predominant involvement of multiple regions of the intestine with normal sections between. Chronic, nonspecific inflammation of the entire intestinal tract characterizes the disease, with the terminal ileum the site most affected. Eventually deep fissures and ulcerations develop and often extend through all bowel layers fistulas.